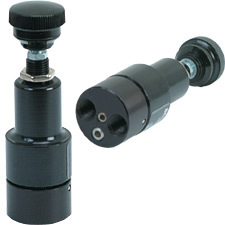 The AR90 Series miniature pressure regulator is a compact, low cost unit which operates in pressure ranges up to 100 psi, with a maximum supply pressure of 250 psi. It provides reliability and accuracy for low flow and dead end applications, but is not designed for critical flow applications. The unit is designed with a corrosion resistant anodized aluminum body with a standard fluorocarbon diaphragm.